The San Diego/Houston Rockets (four in San Diego before moving to Houston for the 1971-72 season), now 43 years old, have been defined throughout the years by the talented big men that have suited up for the franchise. Sure, the Rockets have had the occasional backcourt standout but all of the franchise’s meaningful success has come with a gifted big man (or two) in the middle. It started with Elvin Hayes, a dominant but polarizing (that may be the nicest thing said about him) big man from the University of Houston who joined Rockets in the franchise’s second season and put up massive numbers for four sub-.500 team, one of whom (the 37-45 1968-69 team) snuck into the playoffs and was dismissed in six games. This was a fitting result for the Elvin Hayes era. Why? Because it’s hard to expect much success from a guy who, by all accounts, is one of the least likeable in NBA history and was referred to by Alex Hannum, his first NBA coach, as "the most despicable player I have ever coached." Hannum said this about a stretch when Hayes was a perennial All-Star and good for no worse than 25- 15 a night! The Rockets, now without a big presence in the middle, made the playoff just once in the four years after Hayes’ departure. Then, in the 1976-77 season, the Rockets added a raw 21 year-old center named Moses Malone to the mix. If the Elvin Hayes era was defined by a mercurial star churning out big numbers for some subpar teams, the Moses Malone era was all about toughness and hard work, combined with great talent- all of which Malone used to twice carry the Rockets to the Western Conference finals, and in 1981 to the NBA Finals. In their first 18 years, the Rockets won a grand total of one playoff series (first round against the Knicks in 1974-75) without Moses Malone on the roster. Moses left the Rockets in 1982, sending the team into a tailspin, stumbling to just 43 wins over the next two seasons. Heading into the mid-1980s, the Rockets lucked (tanked?) their way into consecutive No. 1 overall picks and saw the arrival of a pair of potentially transcendent big men- Ralph Sampson in 1983 and Hakeem Olajuwon in 1984. Over the next two seasons, as the pair of gifted big men racked up stats and created matchup hell in the Association, they gave birth to the short-lived Twin Towers era of the 1980s. After the duo led the Rockets to the 1986 Finals, injuries robbed Sampson of much of the next two seasons, and he was traded to the Golden State Warriors in 1988. The Rockets, now Hakeem’s team, endured a string of early playoff exits, and even contemplated trading a disgruntled Olajuwon in the early 1990s. As we all know, Houston hung on to Hakeem, who in turn elevated his game from near-superstar level to “top ten all-time,” and powered the Rockets to the pinnacle of the league with consecutive titles in 1994 and 1995. After Hakeem’s departure around the turn of the century, the Rockets faced a handful of lean years before lucking (this time legitimately) into the top pick in the 2002 draft, 7’6” Chinese big man, Yao Ming. While the Yao era has seen a return a to respectability, the big man’s inability- along with the inability of fellow star Tracy McGrady- to stay on the floor has transformed the past decade in Houston into a mirror image of the careers of its stars. Lots of potential, promises of greatness, flashes of brilliance, but disappointing in the end. This is not the place to take moral stands. I get that. This series of articles is intended to discuss and debate the relative merits of the NBA’s best players throughout the years AS PLAYERS, and not penalize anyone for being a bad guy off the floor. And I have continued to adhere to that here, but man this one tested my limits! So, let’s run down the career accomplishments: Rockets all-time leader in assists (4,402) and FT percentage (89.2%), and second all-time in franchise history (behind Hakeem Olajuwon) in games played (1,002), minutes (30,607), points (17,949), FG made (7,247), FT made (3,445) and steals (1,165). Murphy was selected to the 1971 All-Rookie Team, made his lone All-Star appearance in 1979 and was inducted to Hall of Fame in 1993, after spending his entire 13-season NBA career with the Rockets. He also played a vital role in the Rockets’ first-ever trips to both the conference finals (1976-77) and the NBA Finals (1980-81). Murphy also has the second highest single-season FT percentage in history- 95.8% in 1980-81, when he made 206 of 215 attempts. At 5’9”, Murphy made the most of his physical gifts, with his amazing quickness and ballhawking ability offsetting the effects of his lack of height. Look, I can easily overlook the 14 children nine different women, but it’s hard to avoid a feeling of moral superiority when a guy’s faced three charges of indecency with a child and three charges of aggravated sexual assault of a child, stemming from allegations by five of his daughters. Sorry, I never want to get that heavy, but I hope you understand. There was a duo of Rockets’ PGs that received strong consideration here, one thanks to solid numbers on multiple title-winners, the other on superior stats during an unremarkable stretch for the franchise. Based on his six-year run in Houston, Kenny Smith (12.6 ppg, 5.3 apg, 49% FG, 41% 3-pt in 468 games) would have been a deserving choice. Not only did Smith start at the point for the only two championship teams in Rockets’ history, he actually put together some nice seasons in his time with the franchise. In his first year with the team (1990-91), “the Jet” posted 17.7 ppg and 7.1 apg, and followed that up the next season with a 14- 6.9. He was also an extremely efficient shooter, making at least 47.5% of his field goals and 85% of his free throws in each of his first five seasons with Houston. Kenny Smith is also the franchise leader in 3-point percentage (40.7%; minimum 200 attempts), fourth in 3-pointers made (521) and fifth in assists (2,457). Statistically, the best PG in Rockets’ history is Steve Francis, who was at his “Stevie Franchise” best with the Rockets. In five seasons, Francis averaged 19 ppg, 6 rpg, 6.3 apg and was selected to three All-Star teams. From 2000-01 through 2002-03, Francis put together one of the better three-runs you’ll see from a 6’3” lead guard: 19.9- 6.9- 6.5, followed by 21.6- 7- 6.4 and then 21- 6.2- 6.2. Despite playing for three teams with winning records, Francis made his only career trip to the playoffs as a Rocket, in 2003-04, when they fell 4-1 to the Lakers in the first round. While he was great, averaging 19.2- 8.4- 7.6, the Rockets never posed a threat. Only two guys really deserved consideration here, and that two-horse race wasn’t particularly close. After eleven and a half seasons in Portland, Drexler was traded to Houston- the city where he’d played his college ball alongside Hakeem Olajuwon- where he spent his last three and a half professional seasons and won his only championship ring. Thing is, Drexler was no desperate, fading title-chaser (yeah, Shaq, I’m lookin at you!). A season after their first title, the Rockets had failed to pick up where they’d left off in 1994 and were looking to Drexler to spark the team and make a considerable contribution on the floor. And he obliged, stepping right in and averaging 21.4 ppg, 7 rpg and 4.4 apg in 35 regular season games in 1994-95. Clyde kept up his great all-around play in 22 postseason games, putting up a 20.5- 7- 5, as the Rockets became the lowest playoff seed (#6) to win a championship. After the 1995 title, Drexler spent three full seasons with the Rockets and put together a fantastic all-around stat line, averaging 18.5 ppg, 5.9 rpg and 5.6 apg. Drexler was also selected to a pair of All-Star teams- in 1996 and 1997- as a member of the Rockets, and his 19 ppg average is tied for most in franchise history by a backcourt player. Drexler’s only real competition here was Cuttino Mobley, who averaged 17.1 ppg and 4 rpg in 436 games end-of-Hakeem/beginning-of-Yao era. Nice player, but didn’t really make much of a lasting impact with the franchise. No All-Star appearances (despite averaging 21.7 and 19.5 in the 2000-01 and 2001-02 seasons) and just two playoff appearances in six seasons. On each occasion, the Rockets won a single game before getting bounced by the Lakers. Speaking of Rockets’ shooting guards and the Lakers, wanted to give a shout out to Stu Lantz. Lantz has been Lakers’ color commentator for the past 24 years, but spent eight seasons in the NBA, the first four (1968-69 though 1971-72) with the San Diego/Houston Rockets. He averaged 15.6 ppg in 318 games, and put up 20.6 and 18.5 ppg in his last two seasons with the franchise. It was very tempting to go with Tracy McGrady here. In his first five seasons with the Rockets, T-Mac put up some fantastic numbers (23.1 ppg, 5.6 rpg, 5.7 apg), and played for four playoff teams, three of which won 51+ games. However, it was also during his run with the Rockets that McGrady cemented his status as “injury-plagued” (played over 71 games just once- 78 in 2004 -05), while extending his career-long run of failing to advance beyond the first round of the playoffs. Finally, for all his spectacular play and the great numbers he put up when healthy, McGrady’s pre-trade deadline decision to have season-ending microfracture surgery in 2009 did not win him many new fans in Houston. That was the antithesis of a “face of a franchise” move. You know who wouldn’t have done that? Rudy Tomjanovich. More than anyone other than Hakeem Olajuwon, Rudy T is the enduring face of the Rockets’ franchise. Before you go thinking that Rudy Tomjanovich. Got the nod here out of sympathy for “the punch” or simply because he was two-champ as coach, think again. If Elvin Hayes was the Rockets’ first-ever star, Rudy T was the franchise’s first star that anyone actually liked. Rudy was a one-team man, one of the NBA’s best forwards of the 1970s and was named an All-Star five times- including the year of his return from reconstructive face surgery. Tomjanovich was the second over pick in the 1970 draft and spent the next 11 seasons with the Rockets. While Tomjanovich’s career averages of 17.4 ppg and 8.1 rpg in 768 games are certianly impressive, he was an even better player “pre-Punch.” Rudy T averaged at least 18.5 points and 7.6 rebounds in each of the five seasons from 1972-73 and 1976-77, including his career best 24.5- 9 in 1973-74. He is still the franchise’s third-leading scorer (13,383 points; trails only Hakeem and Calvin Murphy) and fourth leading rebounder (6,198). The season after his skull was nearly destroyed by Kermit Washington’s punch, leaving him reportedly able to taste spinal fluid (read that again) before he was taken into surgery. Although he’s statistically trumped by Elvin Hayes (20.6 ppg, 12.2 rpg in 572 games) and an end-of-the-road Charles Barkley (16.5 ppg, 12.2 rpg3.9 apg in 183 games), Thorpe combined very solid numbers with hard-nosed play on the glass- and did so for a winner. 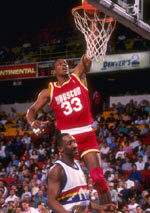 Thorpe spent more than seven seasons alongside Hakeem Olajuwon, culminating in the Rockets first championship in 1994. While he’ mostly remembered as Hakeem’s blue-collar frontcourt partner, Thorpe actually put up some fantastic numbers for the Rockets. He averaged no worse than 12.8- 8.2 in any of his 7+ seasons with the team, four times putting up at least 16.7- 9 and averaging a double-double three times. Thorpe made his lone All-Star appearance as a member of the Rockets in 1991-92, a season in which he didn’t miss a game and averaged 17.3 ppg, 10.5 rpg and 3 apg. Thorpe is one of the best offensive rebounders in NBA history (13th all-time) and ranks third in franchise history (behind Hakeem and Moses Malone) in both offensive and defensive rebounds. Also, his 55.9% FG is the best in rockets’ history, while his 8,177 points are the ninth most in franchise. In addition to his excellent play for the Rockets in the late 1980s and early/mid 1990s and his major contributions to the Rockets first title, Otis Thorpe figured prominently in the Rockets second title as well. Midway through the 1994-95 season Thorpe was sent in a trade to the Portland Trailblazers in the deal that delivered Clyde Drexler to the Rockets. There are a small handful of big men in NBA history with credentials that equal or exceed those of Hakeem Olajuwon, but it’s difficult to think of anyone playing the position more gracefully or with a greater arsenal of skills. 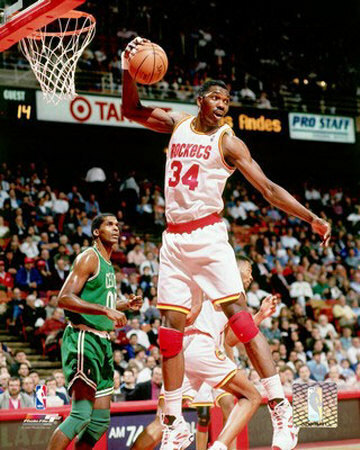 Olajuwon is the Rockets’ all-timeleader in virtually every statistical category- games, minutes, points, rebounds, field goals attempted and made, free throws attempted and made, blocks and steals- and ranks third in assists. In NBA history, only seven guys have scored more points and just ten have grabbed more rebounds. Looking at just centers, those ranking jump to fifth and ninth, respectively. 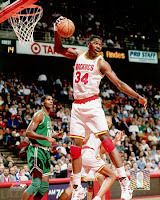 Hakeem’s also the all-time leader in blocked shots and third all-time in blocks per games, although it should be noted that statistics for blocks were not kept until 1973-74. Hakeem’s credentials are also as impressive as anyone’s: 12-time All-Star, six-time All-NBA First Team, three-time All-NBA Second Team, nine-time selection to the All-Defensive First or Second Team, two-time Defensive Player of the Year, 1994 MVP and Finals MVP in both 1994 and 1995. In terms of his meaning to the team, Olajuwon is by far the greatest and most important player in franchise history, and was the catalyst for all success over a near-two-decade stretch. The Rockets reached the postseason in 14 of Hakeem’s first 15 seasons, reached the conference finals four times, the NBA Finals three times, and won a pair of titles in 1994 and 1995. And for good measure, en route to those titles, Hakeem eviscerated every other great center of the 1990s- Patrick Ewing, David Robinson and Shaquille- in the postseason, in their respective primes. And a quick memo to the “Houston would have no rings if MJ hadn’t retired” crew: that claim is probably true of 1995, but the Bulls are probably not to have run into Hakeem in 1994. Yeah, I said it! With all due respect to Wilt, Shaq and Moses Malone, Hakeem’s the third best center in NBA history, and the most enjoyable ever to watch. And speaking of Moses, this makes FO-FO-FO. Four teams for which he’s played, played extremely well, and still not come particularly close to being the all-time best center. 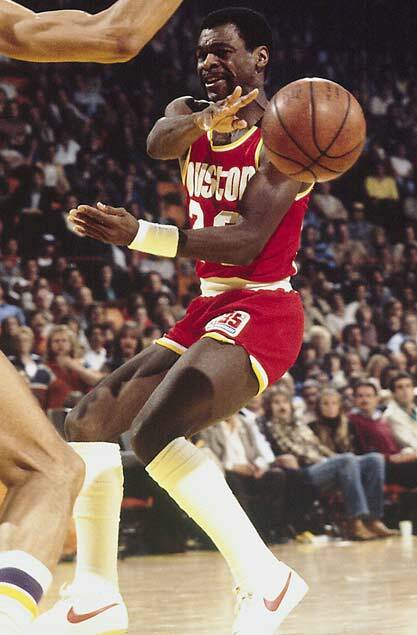 In an exceptional six-year run in Houston, Moses averaged 24- 15 plus 1.6 bpg, was selected to five All-Star teams, four All-NBA Teams, won a pair of MVPs (1979 & 1982) and led the Rockets to their first-ever Finals appearance in 1981. That year, Moses averaged 27.8- 14.8 in the regular season and put up a 26.8- 14.5 in 21 postseason games.